"After inspecting the entire water system, I repaired the leak and installed a new check valve and a section of damaged PVC pipe between the well head and the pool,” he continued. Despite the repairs, the existing well pump had stopped working. That’s when they called in the professionals. The first company wanted $13,000-$18,000 just to pull the pump, assess the situation, and present an action plan with an estimated maximum of an additional $30,000 to fix the problem. Obviously, there needed to be a second opinion. Hansen Well-Do Service wanted $1,000-$1,500 to pull the pump and assess the situation. It turns out that this company had worked at Meher Mount before and had installed the existing pump in 2001, prior to the current Board and Caretakers. After an initial inspection by Hansen, it was discovered that, at times, the water level dropped below the pump, which was about 250 feet below ground level. This drop in water level, in part, explained the lack of water. In addition, since well pumps generally last about 10-15 years, Meher Mount’s well pump was ready to be replaced. 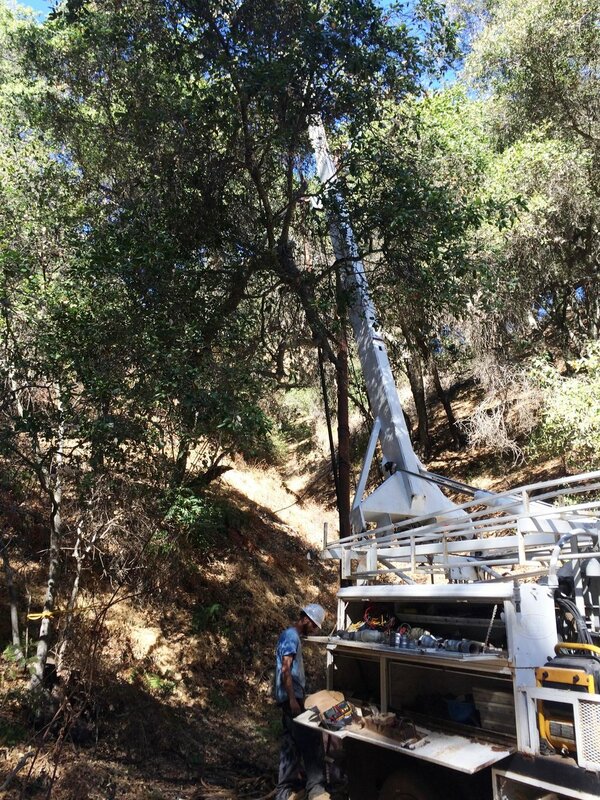 Rather than do a piecemeal repair approach that could have left the water pumping system more vulnerable to outages, it was decided that Meher Mount should do a full upgrade and repair of the major components of the water pumping system. Thus, in addition to a new well pump, Hansen replaced the galvanized pipes in the well with PVC, replaced the electrical panel and electrical lines, and provided dry-run protection, i.e., if the water level were to drop below the pump, there would be an automatic shut-off. The well is 300-feet deep, and the pump was dropped to 280-290 feet. The current water level is about 242-feet deep. Meanwhile, as all this work was going on, Manager/Caretakers Buzz & Ginger Glasky were without water. They hauled water up the mountain in large plastic containers, took bucket baths, did their laundry at a laundromat downtown, and let the lawn turn brown. “It has only been a minor inconvenience for us,” said Buzz. Porta-potties were brought on the property, and Meher Mount was only closed to visitors for about two hours due to water issues. During the no-water time period, there was a tea and talk with Bill and Diana Le Page, the Audubon Society conducted a bird count on the property, and the usual individual and family visits continued for a total of 225 guests during that time period. Hansen’s services cost $7,695, and they continued to work with Meher Mount to assure all components of the system were working properly. They also made useful suggestions for monitoring and operating the water system for the future. One of those useful suggestions was showing Buzz how to measure the depth of water in the well using a simple, homemade gadget. "When Ralph from Hansen was here, he used a gauge to determine the depth of the water in the well,” said Buzz. “He told me how to put one together. It is such a clever little device. He installed plastic tubing down to the pump for this use. Using an air compressor, you add air to the well via the Schrader valve, and the pressure gauge gives you the psi (pounds per square inch). You multiply the pressure times 2.31, and the result is the feet of water over the pump. Subtract this number from 300 and you get the level of the water. Right now the water level is about 250 feet. "I built one for Meher Mount for about $34. Ralph Hansen from Well-Do does not like using a ‘sounder’ to determine depth as they have a tendency to get caught up in the pipes and wiring,” Buzz explained. With very little water in the pool/reservoir, it was decided to completely drain the pool and clean it. Over time, leafy and biological matter can get in the pool – even with a cover – requiring a periodic and thorough cleaning for better water quality. Because of the sulfur in the water, the water in the pool is black with no visibility. That’s why the pool cannot be used as a swimming pool. Other costs for the project including pumps, hoses, labor, filters and the well-depth gauge were $978, bringing the total for the project to $10,067. WHY ONCE AGAIN WITHOUT WATER? "The electrical circuitry at the pool needed repair while we were in India. Bill Lotts repaired the pump, and then upon our return also came to repair the well system that went out. The entire wiring at the pool is a fire hazard. "After discussion with [board members] Lola [Long] and Booby [Hazard], its been decided that Bill Lotts completely secure the electrical at the pool area to make it safe. "There was a problem with the water system when returned, so for several days the water was either black or not flowing at all. After the well problem was repaired, Billy drained and cleaned the pool for the second time this year. He then rigged up a pool cover by recycling the mesh from the old cover and aircraft cable. It didn't sustain an old neighborhood dog falling in, but looks strong enough to keep the leaves out of the water." Then less than a year later, the Manager/Caretakers report in July/August 2001, "There is a problem with the well. Either it is quite low or the pumps needs to be replaced." In the November/December 2001, Bill & Pamela report, "Brandon Hansen of Hansen Well-Do Service completed work on the well. A new pump and motor, steel drop pipe and a well seal and parts to complete the system were installed. The well was chlorinated. "The pool was cleaned before refilling. This is the second cleaning of the year. Water is chlorinated in the holding tank as well, and this seems to have cleared up the water considerably." The total cost for Hansen's services and parts was $3,691.